When it comes to creating an effective marketing strategy, it’ll take a little more than just standard content and some elbow grease. Everyone produces various forms of content every single day, but not all types of content guarantees success and consistency. We have your standard forms of content such as ebooks, infographs and videos, but even those can only go so far before you begin to consider other options. Speaking of other options, what if we had a suggestion of a particular type of content that many marketers today have begun implementing in their strategies? Take a second and look back at something many of you might have overlooked as a form of content marketing. You’ve seen those quizzes on social media networks before, haven’t you? Now think about those quizzes and try to see if you could tie that in with your strategy. It’s an interesting concept isn’t it? These quizzes are highly engaging and you can see that based on how viral some of them can become. From a marketing perspective, quizzes are one of best forms of content to include in any marketing strategy. Today, we’ll show you how to use quizzes in your marketing strategy, and we’ll even include several tools that you may want to consider using. By the end of this article, you’ll be able to walk away with several actionable takeaways that even you might want to use for your brand. The answer “Well, why not?’ might not be enough to tide you over on why you should use quizzes in your marketing strategy, but think about it this way: quizzes are engaging, entertaining, and most importantly, shareable. As a marketer, content as a versatile as quizzes can provide a myriad of possibilities when it comes to your brand; that’s what makes them so valuable. Quizzes have this innate ability to engage audiences. Based on the kind of quiz you create, you’re reaching out to thousands of people, and the moment they take your quiz is the moment you begin to establish a connection with them as a brand through its questions. Because you come across quizzes like these every so often on social media networks, they’re generally entertaining. Even if the subject matter isn’t one of today’s trending topics, quizzes are a great way to add a bit of amusement to the kind of content your brand produces. Continuing with the whole social media trend, quizzes are also known to drive social traffic towards your website. Depending on what products or services your brand provides, you could even use a quiz to help drive real revenue. Pair your quiz up with a lead capture form, and you’ll have even created a consistently reliable lead generation tool for your marketing. How Can You Implement Quizzes In Your Strategy? 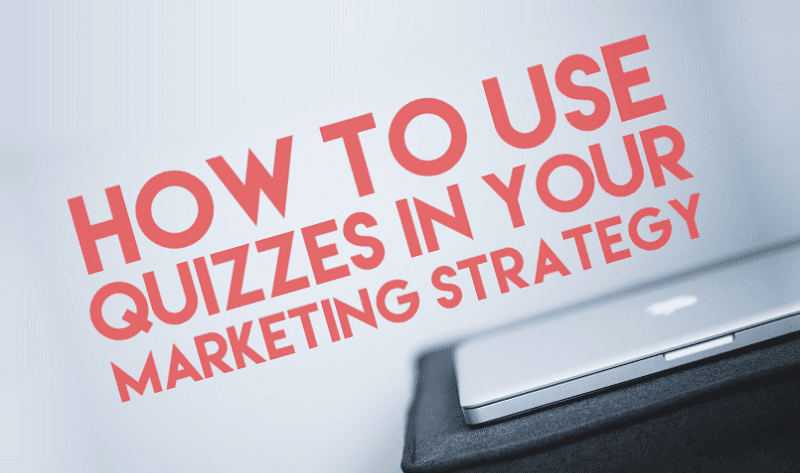 There are several ways you could use quizzes for your marketing strategy. Most brands incorporate them as a means of lead generation, others use the results to their quiz as a way of including a call-to-action. Whatever the reason, we’ll walk you through some of the methods of implementation. If you’re a brand that specializes in manufacturing and/or selling a plethora of different products, consider using a quiz to personalize the shopping experience. This would require a personality quiz that categorizes individuals into personalities. From there, each personality would correlate to a specific item or set of items tailored to someone’s preferences based on how they answered the questions in the quiz. A good example of such an implementation would go to Z Gallerie and their “What is your Z Gallerie Style Personality?” quiz. Their personality quiz asked a set of questions that collected an individual's contact information and recommended a group of products suited specifically to that person's personality. With this quiz, Z Gallerie was able to rack in large amounts of leads per day. Your Takeaway: Considering dividing your products into personalities when you create your own quiz. This will help direct individuals to the products or services that are best suited for them. It’s easy, convenient, and makes making sales a fairly entertaining process. When it comes to lead generation, the warmer the lead, the better. As we go through the standard purchase funnel, you can speed up the entire process by obtaining more qualified leads. That being said, quizzes can also be used to qualify leads while simultaneously generating them. How? With an assessment test. This kind of a quiz can essentially grade individuals based on how much they know about a certain product, software or service. From there, the more knowledgeable someone is with your brand, the more qualified they are to go down that funnel with you until conversion. Cloud Sherpas does exactly what we just covered with their “How mature is your ServiceNow instance?” quiz. The assessment gauges how much an individual knows and grades them at the end, including tips on how to improve along with a link to a webinar and a blog post. While their quiz might seem boring to the general public, it's main purpose is geared towards their target audience. As an enterprise software company, leads are incredibly valuable to them, so even the 3-4 qualified leads that they generate per day is important. Your Takeaway: Create an assessment test that gauges how much your audience knows about your brand, its products, or its services. The more qualified leads will of course be more knowledgeable about your brand, and by zeroing on them, you’ll be able to sift out the warmer leads that will have a higher conversion rate. Product recommendations and lead generation aren’t the only things quizzes are capable of. Any brand can implement a quiz in order to help launch or compliment a campaign. It’s a strategy many brands have used, and because of how popular quizzes are, they help boost most efforts tied to various campaigns. The quiz could be implemented as content that helps inform audiences about the campaign itself. From there, call-to-actions can be included at the end to drive even more results. Children's Hospital Los Angeles used their "Which Therapy Dog Are You?" quiz to help raise awareness about their therapy dog program and to drive donations towards its corresponding foundation. Completion of the quiz had a donor contribute $1 to the Amerman Family Foundation Dog Therapy Program every time. By the end of the campaign, CHLA garnered over 31,000 new subscribers. It was their most successful lead generation campaign ever run. Your Takeaway: Think about pairing a quiz with your brand’s on-going campaign, or consider using quizzes for a future one. It’s a great way to introduce aspects of your campaign (depending on the theme of course), and it adds a sense of fun and engagement. Playbuzz - A nice way to start making your own quizzes without the emphasis on lead generation. You can use this to test the waters and see how quizzes will work for your brand. Their design is simple and easy to implement, and it’s a great way to start creating some of the more entertaining quizzes. Interact - A more dedicated suite with an emphasis on lead generation paired with top-notch customer support. Their intuitive design makes quiz creation and implementation a breeze, especially with their awesome integrations with many of the more well-known CRM’s available. Definitely a must-try application. Snapapp - The pricier option if you’re looking for a suite loaded with a ton of content that deals with more than just quizzes. Their design isn’t incredibly complex either, which is a good thing, and you have a ton of other options to work with in case quizzes aren’t your thing. If you’ve got the budget to spend, this suite is for you. Today, we went over how you can implement quizzes into your strategy along with several examples to go along with them to give you an idea on how those brands made it work for them. Towards the end, we even gave you several options to work with in terms of starting out with quizzes yourself. Hopefully, you were able to get something out of this article. Every brand has a different strategy, and with the amount of content available to you, you’ll more than likely go through the process of filtering through that list trying to figure out which type of content will work best for you. Save yourself some time by considering the use of quizzes. With their reach and versatility, your brand would benefit from the results that these quizzes are capable of.